Shared Volumes Tab: Live Migration feature is used by the Dynamic Optimization feature of VMM. Before you can use Hyper-V Live Migration feature, you would need to add clustered shared volumes to the Hyper-V cluster. 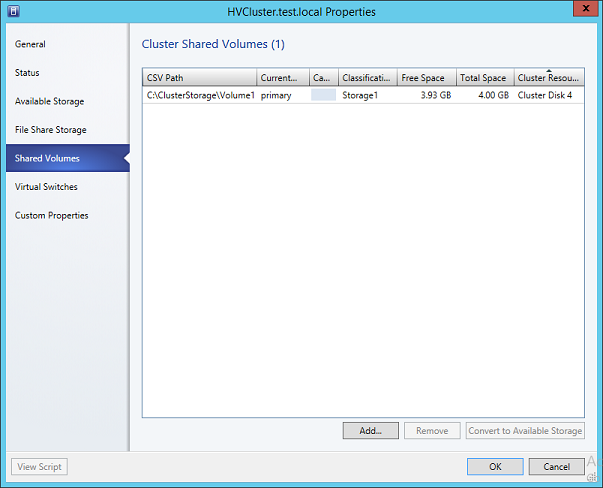 VMM allows you to add VMM managed storage to the Hyper-V cluster as Clustered Shared Volumes. Shared Volumes tab lists all the clustered shared volumes that have been configured in the Hyper-V cluster and also provides you the ability to configure additional storage as CSV to the existing Hyper-V cluster as shown in the figure below. To add the CSV storage to the Hyper-V cluster, click on “Add” button, as shown in the figure above, and then select the available storage to be added to the Hyper-V cluster as a CSV disk. You can select available disks or create a logical unit as shown in the figure below. In case you need to remove\unregister a CSV disk from the existing Hyper-V cluster, click on the “Remove” button. Note that a CSV disk can always be converted to available storage by selecting the CSV disk and then clicking on the “Convert to Available Storage” button. It is important to understand that VMM does not take any action unless you hit “Ok” button on the property page of a Hyper-V Cluster. VMM processes configuration changes by creating VMM jobs that are executed in the background while you continue to use the VMM console. In case you have made any configuration changes to the Hyper-V cluster by modifying any settings on any of the configuration tabs available on the property of the Hyper-V cluster, “View Script” button will be highlighted. When you click on the “View Script” button, VMM will show you a PowerShell script in the notepad that will be executed as a VMM job to process the configuration changes. For example, if you add a disk from the available store to a CSV disk, VMM will create a PowerShell script that will be processed when you hit the “Ok” button. As you can see in the figure below, a PowerShell script was designed by VMM for Disk9 that I intend to add to the Hyper-V cluster. Once I hit “Ok”, VMM will execute PowerShell script to register Disk9 to Hyper-V cluster. 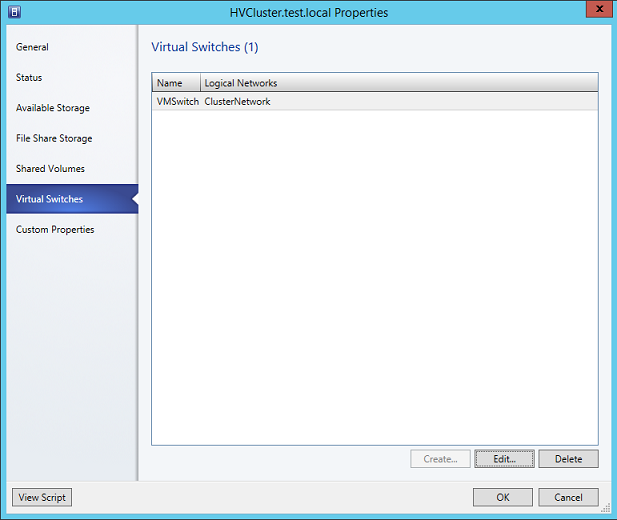 Virtual Switches Tab: Note that all cluster nodes in a Hyper-V cluster must have identical configuration including the virtual switch. You must create common virtual switches on all Hyper-V nodes to ensure a virtual machines migrated to a cluster node across a Hyper-V cluster can be assigned and connected to the same virtual switch. Virtual Switch tab shows the virtual switches that are common across all the cluster nodes as shown in the figure below. As you can see in the figure above, I have created a virtual switch named “VMSwitch”. When I created VMSwitch virtual switch by clicking the “Create” button, VMM created the same virtual switch on all the nodes of the Hyper-V cluster. As you can see in the screenshot below which I took from the Virtual Switch Manager of both Primary and Secondary Hyper-V servers, a virtual switch by name “VMSwitch” was created by VMM on both primary and secondary Hyper-V servers. This indeed is a good thing that VMM does. VMM ensures that all the Hyper-V nodes in a Hyper-V cluster are created with the same switch name and configuration. In case you need to add another Hyper-V virtual switch to the Hyper-V cluster, click on the “Create” button located on the Virtual Switches tab. When you click on the “Create” button, VMM will ask you to select a VMM logical network and the name of the virtual switch that you want to create as shown in the screenshot below. Note that VMM might not provide you the list of VMM Logical networks for selection, if there are no VM logical networks created in the VMM or if VMM Logical networks are not assigned to the Hyper-V hosts that participate in the Hyper-V cluster. 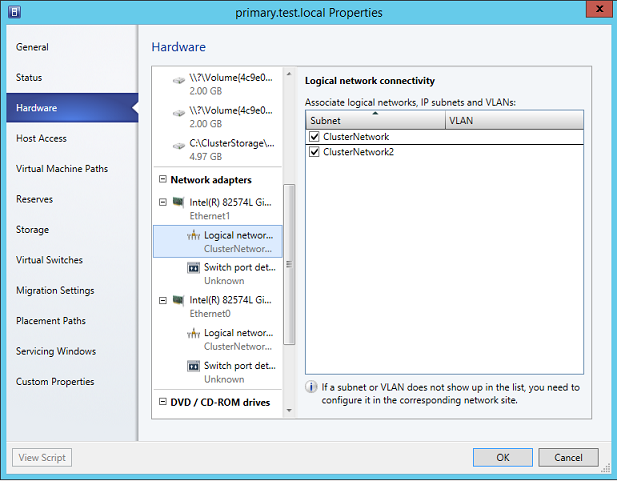 In case you have created a VMM Logical network, make sure the VM Logical network is assigned to all the Hyper-V nodes by navigating to the Hardware tab on the property of the Hyper-V host. At the Hardware tab, all you need to do is assign the VM Logical Network to Hyper-V network adapters as shown in the screenshot below. Custom Properties: The last configuration tab available on the property of a Hyper-V cluster is the Custom Properties. Using custom properties you can control the placement of virtual machines. For example, you can say over what Hyper-V hosts each virtual machine should run on. In this article, we explained Shared Volumes and Virtual Switches Tabs. 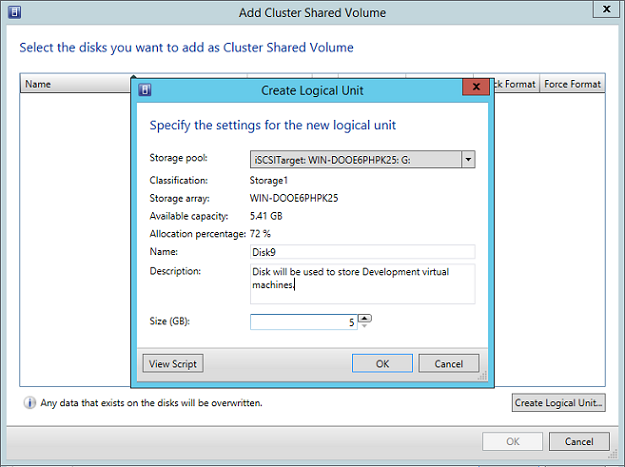 Shared Volumes tab helps you implement Clustered Shared volumes in the Hyper-V cluster. You can add/remove CSV volumes and then deploy the virtual machines to them. 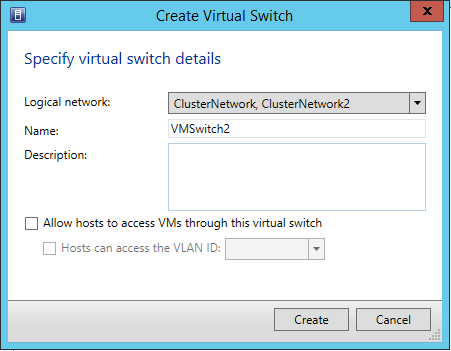 VMM can also help you get a Hyper-V cluster up and running with the identical virtual switch configuration across the nodes of a Hyper-V cluster. Any virtual switch that you define at the property page of a Hyper-V cluster, VMM is going to ensure that the virtual switch name is common across all the nodes of a Hyper-V cluster. In the next part of this article series, we will see how to make a virtual machine highly available in the Hyper-V cluster via VMM and other methods.